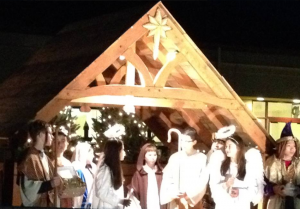 Volunteers needed for annual Live Nativity! It’s that time of year again, Angels and Shepherds are needed for the 4:00 pm Christmas Eve Children’s Mass on Sunday, December 24th at the Assumption Church. If your child is interested in portraying an Angel or Shepherd, please call the Religious Education Office at 609-652-0008, extension 207 and leave the child’s name and a contact phone number. A quick rehearsal will be held on Thursday, December 21st, 6:30 PM at Assumption Church. At that time, costumes will be issued. Set up –12:00pm – 3:00pm. Move Cafeteria tables to Gym and miscellaneous Set up. Cafeteria – 3:00 set up and then then we need people to work behind the counter from 5:00pn – 8:00pm. Live Animal Petting opens at 4:00pm – 5:00pm. Will need at least one volunteer to mind the children inside the manger and watch the line. Clean Up Crew – We will begin clean up at 7:30pm, join us if you have some time to assist us with moving back the tables and clean up. Confirmandi (Manger Volunteers) – A sign Up Genius link has been emailed If you have not received any information but would like to participate please let us know so we can place you on the schedule. Entertainment – Do you know of an individual singer, choir or dance team that would like to participate? Please let us know. We could also use bales of hay or straw, Juice (Box) and Food donations.